Anyway, start by adding butter, sugar and vanilla extract to the bowl of your mixer. Mix it on medium to high speed, until it’s light and fluffy. Chop/crush your coconut and use ¾ of a cup of finely shredded unsweetened coconut. Add them to your butter/sugar mixture and mix for a couple of minutes on medium speed. In another bowl mix the flour, cornstarch and salt together then gradually pour this mixture over the butter mixture and mix until everything is well incorporated. 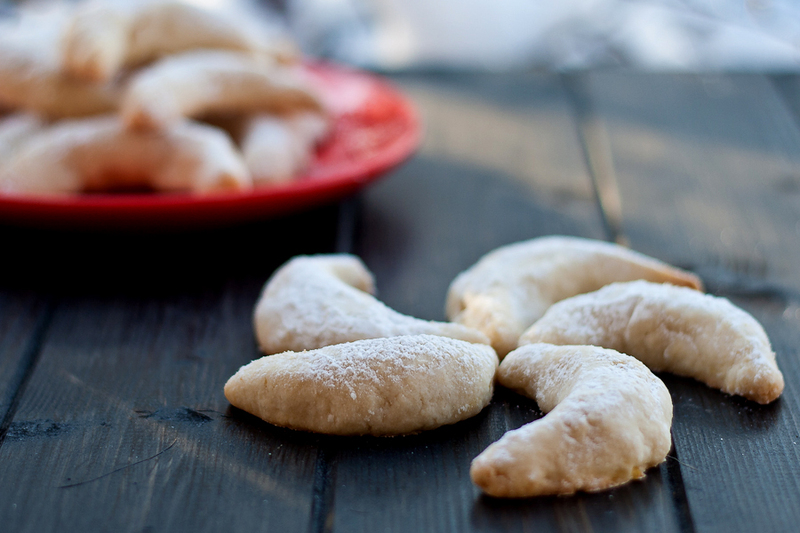 After an hour, preheat your oven to 325° F / 160° C and start shaping your cookies into crescents. Place them 2 inches (5cm) apart on an ungreased cookie sheet or a silicone baking mat and bake them for 20 minutes. Cool on a wire rack, sprinkle some powdered sugar… and you are done. In the bowl of your mixer, mix the butter, sugar and vanilla until nice and creamy. Get the coconut and pineapple ready then add them to the butter/sugar mixture and swirl for a couple of minutes. In another bowl mix the flour, cornstarch and salt together then gradually pour this mixture over the butter mixture and mix until everything is well incorporated. Wrap the dough in plastic wrap and refrigerate for an hour. 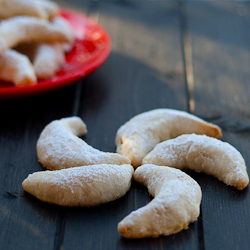 Preheat your oven to 325° F / 160° C and start shaping your cookies into crescents. Place them 2 inches (5cm) apart on an ungreased cookie sheet or a silicone baking mat and bake them for 20 minutes. Cool on wire racks and then sprinkle with powdered sugar. I love your recipes, Where do you fine unsweetened coconut? Oh, usually grocery store, baking section. It’s the little packs of shredded coconut, some are unsweetened.